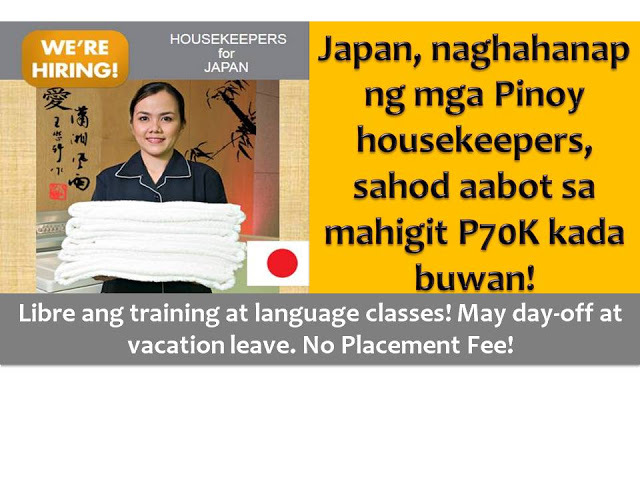 THOUGHTSKOTO Thoughtskoto : Planning to Work as Housekeeper in Japan? Watch This! 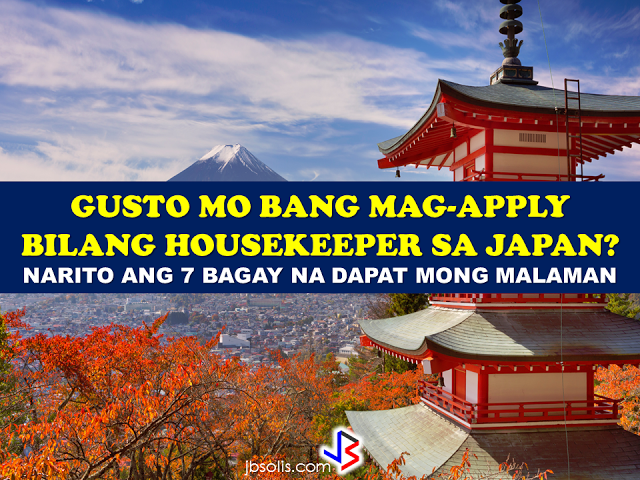 Planning to Work as Housekeeper in Japan? Watch This! But aspiring housekeepers in Japan needs a long process of application and training before being qualified for the job. This year, not more than 100 Filipino housekeepers are being deployed in Japan as part of first foreign housekeepers to be hired under a government policy. The policy aims to help Japanese professional women to enter the workforce after having children. The deployment of Filipino Housekeeper in Japan starts in Kanagawa Prefecture and in the City of Osaka but the Japanese government eventually wants to expand the program nationwide. Last February, there are about 50 Filipino housekeepers are expected to arrive in Japan to undergo training before being dispatched to clients. Previously, only certain households, such as those of foreign diplomats, were allowed to employ foreign housekeepers. But in 2015 the Abe administration pushed to deregulate the market in a bid to increase participation by Japanese women in the workforce. The legal change, which is also aimed at easing labor shortages in the housekeeping industry, paved the way for non-Japanese to work as domestic help in some designated areas, including Kanagawa and Osaka. Duskin, a major cleaning company sent four of the housekeepers to Kanagawa, four to Osaka while the Pasona staffing firm dispatched 25 to Kanagawa. Bears, a housekeeping service provider, dispatched eight housekeepers in two areas, while Poppin which offers child care, educational support services, and nursing care, sent five to Kanagawa. The workers will not be allowed to engage in nursing care. Must undergo training for at least 200 hours. Those who are hired as housekeepers can stay in Japan for a maximum of three years. According to Marlon Rono, president of Magsaysay Global Services, to be a professional housekeeper, you need to undergo 400 hours or two months of training. They are the first group of housekeepers that arrived in Japan last March 19 after restriction on housekeeping services provided by foreign workers were lifted in "national strategic special zones." 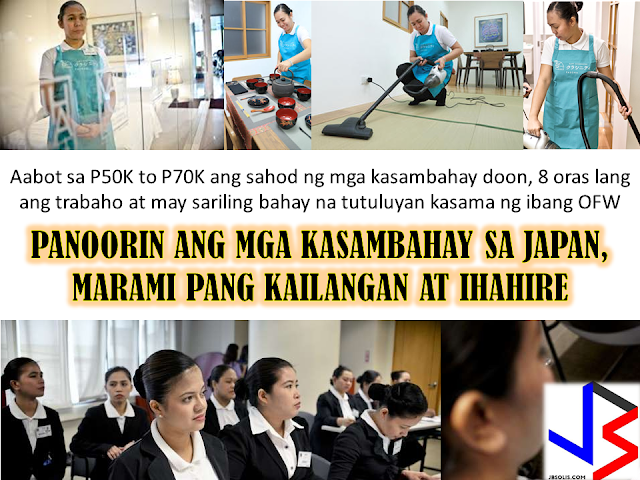 Currently,there are only 2 licensed Philippine agencies with approved job orders for Filipino housekeepers issued by the POEA, (Magsaysay and Studio Kay International Corp.) Therefore, be wary of unlicensed recruiters, travel agents, consultancy firms, training centers which might be promising moon & stars, relative to this opportunity. Beware! They are not authorized to recruit and deploy workers for Japan.